The “Times Square” in New York is known as the “crossroads of the world”, and is the commercial center that attracts the attention of the world. 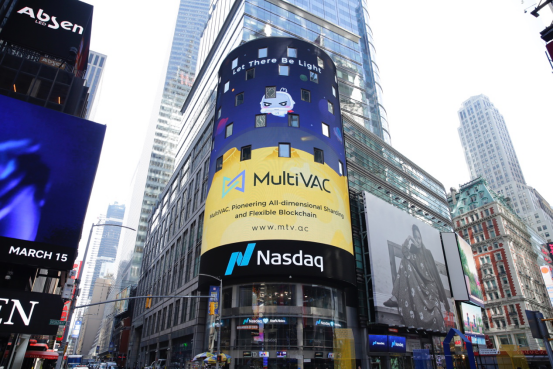 On March 15th, 2019, the new generation of blockchain platform MultiVAC was invited to land on the “World’s First Screen” — the Nasdaq screen on Times Square, delivering its advanced blockchain concepts and technologies to the world. MultiVAC’s strong landing on the Nasdaq Big Screen this time is not only a demonstration of its technology and community strength, but also a demonstration of the blockchain industry’s determination, and power in transforming the real economy to people all over the world also a pioneer in this field. MultiVAC is the world’s first flexible blockchain platform based on trusted shards. It realizes the full scalability of blockchain system by computing, storing and transmitting all-dimensional shards. It also created an elastic computing model, transforming the impossible triangle of blockchain into elasticity, which in turn achieves the industrial-level performance. In February 2019, MultiVAC released its testnet 1.0 “Phoenix”. Lv Heng, CEO of MultiVAC, said that, “For MultiVAC, landing in Times Square in New York is just a small step for the blockchain to be known by the world; as MultiVAC’s influence increases, we continue to promote the blockchain technology and its wide application on a broader platform.